With planto sheets and cloths. Topiary clipping is an art with thousands of years of tradition. Grave paintings in ancient Egypt testify the shaping of plants. Also on Persian miniatures and Roman frescos we can find artfully trimmed trees and shrubs. With the Romans the art of clipping plants came into our realms. Through monastery gardens the art of shaping plants came into our gardens. Low boxwood hedges make wonderful borders for vegetable, flower and herb beds. Best suited for topiary is the Buxus with its various types. It can be cut into almost any form - whether as artistically ambitious figure or as straight flowerbed border. For beginners we recommend to use shape tools made of wire or cardboard or to use thread lines. Too easy your clipping can get "out of shape" in the truest sense of the word. 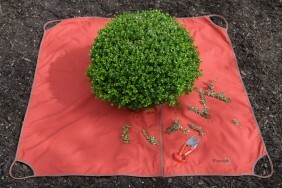 The planto topiary sheet or the planto hedge sheet have both proven to be ideal for topiary clipping. They can be easily spread beneath or beside the plants. 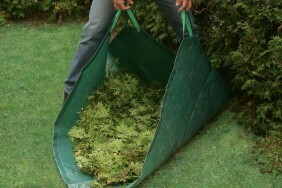 The cutting waste can then simply be disposed of on the compost heap. With the right accessories topiary is great fun and easy to learn.